BEIT JALLA, West Bank (CNS) — Once there was a poor man with three daughters. When the daughters came of age to be married, the man did not have enough money for their dowries. But, miraculously, someone threw three bags of gold into their home on three consecutive nights, enabling the girls to be wed. Ask any Beit Jalla Christian, and he or she will point out the poor man’s house — and the windows through which the bags were thrown — located right next to St. Nicholas Greek Orthodox Church in the center of the village. The building is slated to be made into a library. The story about the three daughters, attributed to St. Nicholas in varying versions in numerous European countries, is one of the legends regarded to be historical in its essence. St. Nicholas came on a pilgrimage to the Holy Land and, according to Beit Jalla legend, he lived for four years in a tiny cave above which St. Nicholas Church now stands. To this day, Christians say, he continues to perform other miracles in this largely Christian town near Bethlehem. Every year, to celebrate the Orthodox feast of St. Nicholas — which this year is Dec. 19 — Christians of the village gather to celebrate with concerts, a candlelight procession to the venerated cave, festive meals and gifts for the children. It is a three-day event beginning with the feast of St. Barbara, then St. Saba and culminating with St. Nicholas’ feast. Every Christian family in Beit Jalla has at least one member name Nicholas, she said, and on the feast day families hold a special meal in their honor and give them special gifts. St. Nicholas was born into a wealthy Greek family in the third century in a village located on what is now the southern coast of Turkey. After he was orphaned, he dedicated his life to serving God and used his inheritance to help the needy. Nicholas was still young when he was made bishop of Myra. As bishop he became renowned for his generosity to the needy, his care for children and his concern for sailors. 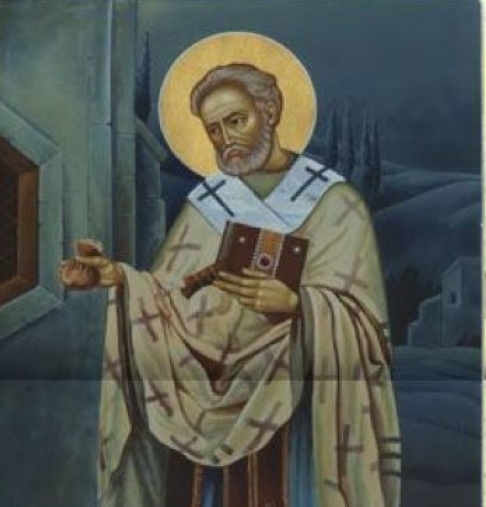 St. Nicholas was persecuted for his faith by Roman Emperor Diocletion and was exiled and imprisoned. Following his death Dec. 6, 343, he was buried in Myra. In 1087 when the Turks conquered the region, Christians feared they would not be allowed to visit the tomb, so Italian sailors removed the saint’s relics to the Italian port city of Bari. While in most of the United States St. Nicholas developed into Santa Claus, in more than 30 countries around the world the beginning of the Christmas season is marked with the separate celebration of St. Nicholas’ feast day, when children are given gifts. In many U.S. Catholic parishes and families with Dutch or German roots, the feast of St. Nicholas still is a prominent part of the holiday season. Such Christmas symbols as the candy cane, the hanging of stockings and the giving of oranges or tangerines have their roots in the story of St. Nicholas. As the prayers finished at St. Nicholas Church in Beit Jalla Dec. 18, families with small children, grandmothers in dark dress coats and bands of young people made their way in the crisp late afternoon air to the Orthodox Club social hall, where choirs from the various churches performed. The Rev. Saliba Rishmawi, the Lutheran minister preparing the Lutheran choir, said St. Nicholas is the defender of Beit Jalla. During World War I and World War II, it is said that people saw St. Nicholas stretched out over the village, protecting the Christians. During the intifada, or Palestinian uprising, people prayed to St. Nicholas for protection. According to the traditional lore, in the fighting following the Israeli 1948 declaration of independence the village’s Catholic priest, who later became the patriarch of Jerusalem, saw a man with a flowing white beard, hands outstretched, catching bombs aimed at the village. Knesevich said villagers also pray to St. Nicholas when they need help, as she did when she was a young girl and there was a terrible drought in the region. All the Christian villagers gathered at St. Nicholas Church and called out to their patron for rain. Following the prayer, the priest ceremoniously knocked on the door with a stone. “Before we reached our homes the rains came. I saw that rain with my eyes,” she said. Even the threat of graying skies during this year’s celebration did not dampen the spirits of cousins Raneen Mukarker, 13, of Beit Jalla and Dima Mukarker, 15, of Ramallah, West Bank. Because of Israeli checkpoints and closed roads, the cousins get to see each other only a few times a year, although they live less than an hour apart. Dima’s family came to Beit Jalla for the St. Nicholas festivities, and after the prayers Dec. 19 the families were to gather for their holiday meal and exchange gifts while the two girls catch up.